Happy Wednesday! 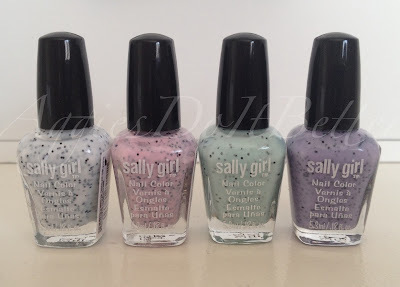 Today I have swatches of the new little mini-set of Ice Cream Shoppe polishes from Sally Beauty Supply. I don't buy mini's often, and especially these, but they were too cute to pass up! First up is Chocolate Chip. (BTW the names are not on the bottle, grrr, I went with what the display said! There's a pic of it at the end.) This was the most sheer of all. I even used a ridge filling basecoat and it STILL took 3 generous coats and could still probably use more. I would definitely recommend using a white base under this. That being said, how cute! Reminds me of Oreos! Next up is Cherry Chip. This is 2 coats, no base or top coat. All of these dried a little matte for me, I would use a topcoat if I was wearing long term. All the rest of these are much more opaque than the white. Next is Mint Chip. Mint chocolate chip ice cream was my FAV as a kid. True for everyone, yes? This is 2 coats, no base or topcoat. This would look cute and maybe a litte brighter over a basecoat of pure mint green. Last is Grape Sherbert. Confusing name, no? I guess Grape Chip doesn't really sound appetizing? Same as others, 2 coats, no base or topcoat. Here is what they look like in the bottles. So cute! A few thoughts: These are super cute!! My favorite would be the white if it wasn't so sheer. Lesson learned! Removal was NOT fun...tiny little black dots everywhere! It looked like ants!!!!!! Lastly, there will probably be some saying these look like dupes for the Deborah Lippmann Staccato collection that came out last year. I don't have any of those so I can't say for sure, but from looking at pictures online, they sure seem close. The DL collection has the same colors-pink, green and purple. No white. This is what the display looks like in the store. In my store it was on the table with the registers.